The amount of everyday objects augmented with computing technology is rapidly increasing. This allows to provide or use services of objects through the Internet, for instance controlling a device like a coffee machine or measuring the usage of a vending machine. 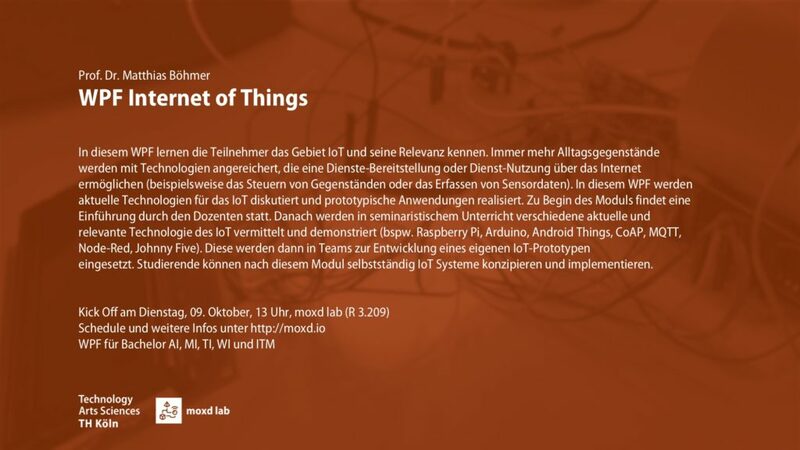 Due to the growing relevance of the IoT in various domains we are offering a module dealing with its technologies (like Raspberry Pi, Arduino, MQTT, Node-Red, Johnny Five). In this WPF you will learn about the basics and the relevance of the IoT. During this project-oriented class you will learn how to connect non-computing devices to the Internet following an approach of brainstorming an idea, designing a system and prototyping a product. This course will be interdisciplinary with design and business administration students. Prof. Böhmer is cooperating with Prof. Nina Juric and Prof. Dr. Chrisitan Zabel. Some reports about previous interdisciplinary courses have been published here and here. Some joined meetings will take place at the Cologne campus, in particular within the week of Profil2.